This project was an 18th anniversary gift for my wife. The second one was also special because I got to pass on the craft to a friend while mentoring him on the methods. He was very dangerous with tools but after server all safety lectures has a heathy respect for power tools now. My teaching him was a wedding gift to him and his wife. He is making it for his bother who is getting marred in October. The tramel routing jig was built to flatten the glue up once it was turned to end grain. Thanks for great advice here warning me not to run end grain through the planer. They were made using free scrap lumber from the mill and oak he got from the rail rail that they used for cribbing to hold industrial pipe being shipped. Most were white oak 2×6x7ft boards we milled from rough cut lumber. I also made my workbench out of the oak. Only a leg vise and under cabinet left on that. Thank for looking please ask questions or provide feedback. Now back to the shop to finish my workbench. They are too pretty to use. They came out good. Like the blend of woods to produce final pattern. They appear to have a sheen to them. What cutting board oil did you use to condition the boards? The Que Tip, the finish is three coats of Howard’s cutting board oil. I get it at the big box stores. It’s made up of mineral oil, bees wax, and carnuba wax. It’s about 7 dollars and lasts a long time after the bard is conditioned. After every 45 days or when needed the finish can be renewed pretty easily. Wow! Fantastic boards…very nice pattern. I like your router jig. I have not used one, but have considered. I run my end grain boards, made from maple, cherry, and walnut, through my planer. I glue a sacrificial piece of board, not hardwood and not end grain, to the front and the back. I also make very small passes. The sacrificial piece prevents tear-out. I have not had a bad experience using this method, though once the sacrificial piece came off and I had to glue it back on and wait for the glue to cure, 24 hours. I do get superficial planing lines on my piece where the blade has left trailing marks, but they sand off relatively easily. I start with 60 or 80 grit and work up to 320 grit. I would much prefer to use a drum sander, but I’m currently overseas and am not in a position to get one (workshop space is limited) and they are quite pricey and heavy. Rather than buy a small (non-heavy) sander which is fairly inexpensive, I’ll wait until I’m back in the States and buy a mid-grade / mid-size one. Just my two cents, for what it’s worth. TT, thanks appreciate it. I thought about planning the end grain boards but decided against it due to the chance of failure of the wood and machine. I went with out a planner for a lot of years so I researched better alternatives for my situation and found the jig to fit the bill. 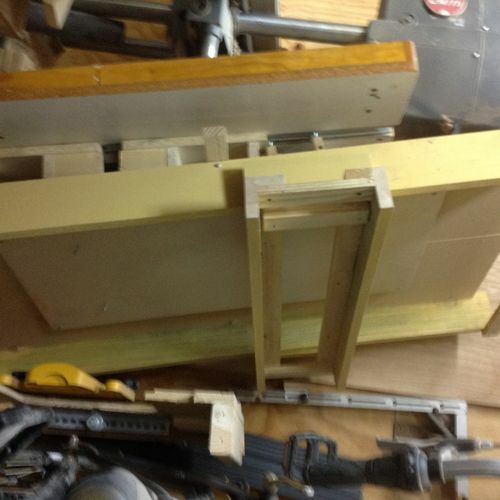 Also I was flattening a Workbench to fit mortises for legs and made the jig to handle both. Mine is made out of pine shelving given to me. Basically two parallel sides and a mount to slide the router. I use a strait up cut bit and slide back and forth until done. Oh and shim the board so it does not rock when being routed. Then turn over and repeat without shims and you have two parallel surfaces. It works great for boards that don’t glue up flat especially. With this method I am starting with 80 and working up to 220. I suspect the open end grain requires sanding this way with either method. I like your boards also. Great pattern and attention to detail. Jason, I appreciate your kind words about my work. As for using a router and jig for flattening, that works. I found however that I can use a router to flatten my boards—smoothing after uneven glue-ups. I will sometimes use 60 grit and an orbital sander to knock off the bigger gobs of glues before planing. During glue up, I will glue on sacrificial pieces of non-hardwood that is the same height as the end grain board on the front and back of the board. This prevents the good wood from blowing out. Then I simply cut off the sacrificial piece when done. I do make very small passes with my planer. The time it takes me to get the board smooth is probably the same amount of time it might take to use a router and jig (give or take) so I don’t think I’m saving anything time-wise – though I save the time it would take to build the jig. I’ll keep an eye out for more of your great work.